Boeing and Apple both posted declines for the quarter, but one industrial juggernaut had an excellent quarter. Boeing was one of a few Dow components posting quarterly results last week. Image source: Boeing Co. Despite gradually rising through the week last week, the tone quickly changed for the markets, including the Dow Jones Industrial Average (DJINDICES:^DJI), which quickly reversed Thursday and threatened to wipe out half of April's gains. The sell-off during Thursday's trading session was due to a couple of factors. Apple (NASDAQ:AAPL) drove headlines with its first drop in quarterly revenue in 13 years, which I'll get to in a second, while the U.S. posted a weak reading on first-quarter GDP. Heck, even Japan threw a wrench into the mix by surprisingly leaving its monetary policy on hold. While the markets slid toward the back end of the week, at least oil prices set 2016 highs for the week -- which is at least good news for the cratering energy sector. Here are a couple of highlights from two Dow companies making big headlines. It was inevitable that one day Apple's iPhone sales would dip. Declining sales are just a fact that every company and investor deals with. And Apple has now posted its first-ever decline in iPhone unit sales, when it announced that it sold 51.1 million iPhones last quarter, down16% from the prior year. Now, the headlines spoke of the decline, and the result definitely sent the company's stock lower last week, but in reality it still drove total revenue of $50.6 billion and a net income figure of $10.5 billion, or $1.90 per share -- nothing to sneeze at. As for the average selling price in the iPhone segment, the figure dropped from $691 to $642 during the quarter, probably because the new iPhone SE was selling for less than previous iPhone models. Beyond just the iPhone, revenue was expectedly weak in the iPad and Mac divisions as well. iPad revenue dropped 19% to $4.4 billion compared with the prior year, and sales of Mac products dropped 9% to $5.1 billion. On the bright side, Apple's services division – which includes revenue from Apple Pay, Apple Care, Internet services, and licensing -- posted a 20% revenue jump to $6 billion. On the downside, management ultimately expects continued weakness in the third quarter and guided for sales in the range of $41 billion to $43 billion. That would equate to a decline of between 17% and 13% from last year's third quarter. It was a busy week for The Boeing Co. (NYSE:BA) and its investors. The commercial aircraft giant took a surprise $156 million charge for its KC-46 tanker when it announced earnings midweek, which helped send its first-quarter profit down 9% to $1.22 billion, or $1.83 per share. Boeing also took a $70 million pre-tax charge for its 747 program, which equates to roughly $0.07 per share after tax. "Higher year-over-year deliveries of military aircraft and continued solid operating performance on core production programs drove revenue growth and strong cash flow for Boeing in the first quarter," said Chairman, President, and Chief Executive Officer Dennis Muilenburg in a press release. "This performance enabled our ongoing investments in new product innovation and in our people, and the return of significant cash to shareholders through stock repurchases and dividends." Boeing reinforced its full-year guidance, saying it would make up any lost ground through other business segments throughout the year, including an improved defense business in the first-quarter. Another development for the aircraft manufacturer came last week when Airbus Group and Boeing split a $10 billion order for 35 wide-body jetliners from China Eastern Airlines Corp. The airline carrier, which is China's second largest, agreed to purchase 20 Airbus A350-900s worth roughly $6.16 billion at list prices and 15 Boeing 787-9s valued at nearly $4 billion at list prices. Ford's F-Series sales are printing money for the automaker. Image source: Ford Motor Company. 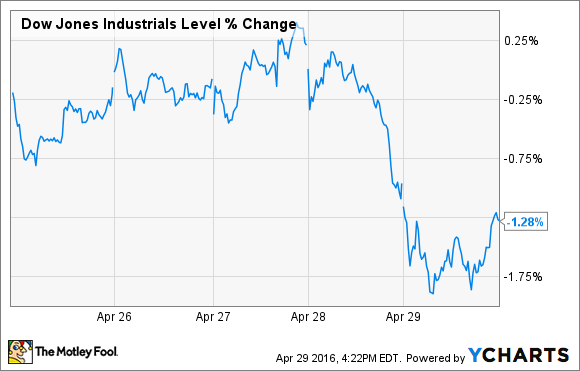 Outside the Dow, an industrial giant posted an excellent first quarter and crushed analysts' estimates. Ford Motor Company (NYSE:F) investors knew it was going to be a solid quarter on the back of fast-selling and highly profitable SUVs and trucks, but few probably guessed it would be such a strong quarter overall. Ford's top-line revenue jumped $3.8 billion higher than last year's first-quarter mark of $37.7 billion, and its $3.8 billion in total pre-tax profit was a huge $2.1 billion jump from last year. In other words, this was Ford's best quarterly profit in North America, and its best quarterly profit in the company's history. Part of that record quarter was due to the company's surging operating margin, which came in the face of rising fleet sales throughout the first quarter. Ford's operating margin in North America jumped 510 basis points from 7.8% to 12.9%, which is an extremely strong figure in the automotive industry. Also helping Ford's impressive quarter was a region that's been a thorn in the company's side for years now: Europe. Ford's wholesales in Europe moved 6% higher during the quarter, pushing its market share up to 8%. Ford's revenue was flat in Europe compared with the prior year, but it managed to generate $434 million in pre-tax results, which was a substantial increase from last year's $42 million. Another region on the rise for Detroit's second-largest automaker was its Asia-Pacific region. Ford posted a 9% sales gain throughout the quarter, which drove revenue 18% higher. Ford gained 30 basis points of market share and improved its operating margin in the region from 4.6% to 8.2% -- that all added up to pre-tax profits that more than doubled to $220 million. It was a strong quarter indeed, but Wall Street is still hesitant to buy into major automakers. The growth story is less certain, as new-vehicle sales in the U.S. remain near record highs and could face a slowdown in the years ahead. It's easy to understand investor frustration when a company posts some of its most profitable quarters in history, only to be rewarded with a 15% decline in share price over the past year.